Step-by-step instructions for ditching your devices and navigating the world without an Internet connection. During his digital vacation, Baratunde disappeared from social media. Now he’s back, but not at the outrageous levels of his pre-detox existence. Monthly totals of tweets, posts, and check-ins: Baratunde’s daily activity dropped to zero for 25 days between December 14 and January 7. So you need to unplug. You’re feeling overwhelmed by your gadgets–connected to your email list but not to your personal life. It’s time to take a break. It is precisely for times like these that we’ve created this guide to unplugging. These step-by-step instructions will walk you through the difficult (but rewarding!) process of unplugging, from deciding when to unplug to informing your friends and coworkers that you’ll be offline for a while to avoiding the biggest temptations to plug back in. Here you’ll find advice from digital detoxing experts, business leaders, and our readers, whom we asked to use the #unplug hashtag to submit their best methods for logging off. We encourage you to click here to print these pages, and when you find yourself reaching for your phone, reach for this guide instead for tips on how to overcome the urge to use your devices. And when you’re ready to rejoin the digital world, come to FastCompany.com, and we’ll help you find the most seamless way to do so. When Is The Best Time To Unplug? Take the morning: Superlative executives tend to get up super early to work out, read, and otherwise get a jump on the day. If you have an iPhone, extend the do-not-disturb time past your wakeup to add in some quiet time. Take the afternoon: A recent study showed that 2:55 p.m. is the point in the day when productivity levels are at their lowest. Why not take that time to step away from the office and defray your brain? A study published in the British Journal of Sports Medicine suggests green spaces lessen “brain fatigue”–the feeling of being distracted, forgetful, and flighty. So go for a walk around the park. I considered fleeing to a remote island for a few weeks, but I realized I wasn’t craving physical escape. I didn’t actually want to be alone. I just wanted to be mentally free of obligations, most of which asserted themselves in some digital fashion. However long you plan to unplug, start prepping now. Identify a time that works for you, and start making a list of things you’d like to accomplish while you detox. But before you #unplug, it’s best to prepare yourself to deal with the questions typically answered by your device, the Web, or an app: How will I get in touch with people if I don’t have my phone? What’s the best way to find a good restaurant without searching Yelp? Where in the hell am I? It’s at these moments that you will be tempted to use. The good news is that there’s a way to prepare for the urge to re-plug by identifying then remembering what, exactly, you want to #unplug from. For his 25-day detox, comedian and author Baratunde Thurston didn’t want–or need–to abandon the Internet completely. Not every aspect of digital life was problematic. It’s the Web, not, like, crack. But social media (“including, but not limited to, seeing, reading, downloading, syncing, sending, submitting, posting, pinning, sharing, uploading, updating, commenting, tagging, rating, liking, loving, upvoting, starring, favoriting, bookmarking, plus-oneing, or re-anythinging”) and business activities were prohibited. To decide what you want to take a break from, first take inventory. “Start by keeping a time log,” suggests Kimberly Young, founder and director at the Center for Internet Addiction Recovery. Turn off automatic sync on your phone: You can live without notifications from ESPN, Boing Boing, and Mafia Wars for a few days–a couple of weeks even! Give yourself a time cushion: If you get lost, you’ll have sufficient enough time to ask for help. “Instead of Instagram-ing something for everyone else, take a moment to make a 4-inch frame with your fingers and internalize the world through this new lens. Then then draw it or write it. You’ll remember that moment more by drawing it writing it or reflecting on it than you will by taking a photo of it.” –Levi Felix of Digital Detox, retreats. “Relax! If a major event happens, someone around you with a mobile device will let you know.” —@markcgullett, Fast Company reader. For his personal digital unplug, Baratunde Thurston went to great lengths to alert his friends and colleagues he’d be going offline. This was, he discovered, harder than it sounds, particularly when it comes to social media connections. 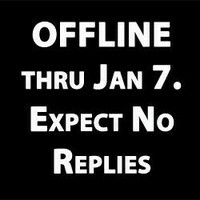 So after making a series of loud social media announcements about his upcoming departure from the digital world, Thurston changed his profile photos to read “OFFLINE THROUGH JAN 7, 2013. EXPECT NO REPLIES.” “In an era of high-definition, handheld, multiparty, and free wireless video chat, my best option was essentially a smoke signal,” he writes. Schedule your unplug time: “Figure out when you can take a real break. If you want a true digital detox, two weeks is far better than one,” Thurston says. If you can’t take two weeks away, try unplugging for the weekend or even once a week. Here are a few other options. Finally, when you’re ready to replug, visit Fast Company for advice on how to dive back into your stream without feeling like you’re drowning and how to make sure you don’t get in over your head again. Click here to print a .pdf of this page.